For decades, scientists believed that after a child’s first few days of life, cardiac muscle cells did not divide. Instead, the assumption was that the heart could only grow by having the muscle cells become larger. CracksÂ were alreadyÂ appearingÂ in that theory. But new findings in mice, published May 8 inÂ Cell, provide a dramatic counterexample — with implications for the treatment of congenital heart disorders in humans. The burst of cell division is driven by a surge of thyroid hormone, the researchers found. This suggests that thyroid hormone could aid in the treatment of children with congenital heart defects. In fact, doctors have already tested thyroid hormone supplementation in this setting on aÂ small scale. The findings also have broader hints for researchers developing therapies for the heart. Activating the regenerative potential of the muscle cells themselves is a strategy that is an alternative to focusing on the heart’s stem cells, says senior author Ahsan Husain, PhD, professor of medicine (cardiology) at Emory University School of Medicine. “It’s not as dramatic as in fish or amphibians, but we can show that in young mice, the entire heart is capable of regeneration, not just the stem cells,” he says. The Emory researchers collaborated with Robert Graham, MD, executive director of the Victor Chang Cardiac Research Institute in Australia. Co-first authors of the paper are Nawazish Naqvi, PhD, assistant professor of medicine at Emory and Ming Li, PhD, at Victor Chang. 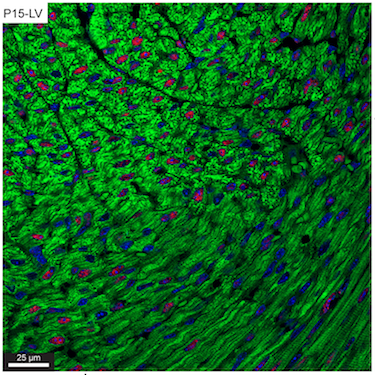 The discovery came unexpectedly during the course of Naqvi and Husain’sÂ investigationÂ of the role of the gene c-kit â€“ an important marker for stem cells — in cardiac muscle growth. Adult mice with a disabled c-kit gene in the heart have more cardiac muscle cells. The researchers wanted to know: when does this difference appear?